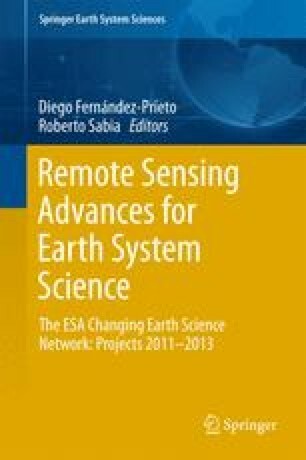 The validation of the SMOS Level 2 soil moisture product in the Rur and Erft catchments, Germany, showed that two main directions for enhancement should be followed: (i) improving radio frequency interference (RFI) mitigation strategies, and (ii) improving the parameterization of the radiative transfer model (RTM). Therefore, in this chapter two methods are developed to investigate the characteristics of RTM parameters, with a strong focus on soil surface roughness and vegetation opacity. One approach uses a dual state-parameter estimation technique in a data assimilation environment to select adequate parameters. It is a one-dimensional synthetic experiment neglecting spatial pattern of soil moisture as well as parameters. The spatial scale comes into play by investigating the feasibility of parameter estimation from synthetic disaggregated SMOS brightness temperature time series for the Rur and Erft catchments. A new partial grid search approach to parameter estimation (PAGSAPE) is developed in order to reduce computational cost compared to ensemble methods, which is important for future global applications. This study was supported by the German Ministry of Economics and Technology through the German Aerospace Center (50EE1040) and by the European Space Agency (Support to Science Element (STSE) Program: SMASPARES). In situ soil moisture for the Rur and Erft catchments were made available by the Terrestrial Environmental Observatories (TERENO) initiative.